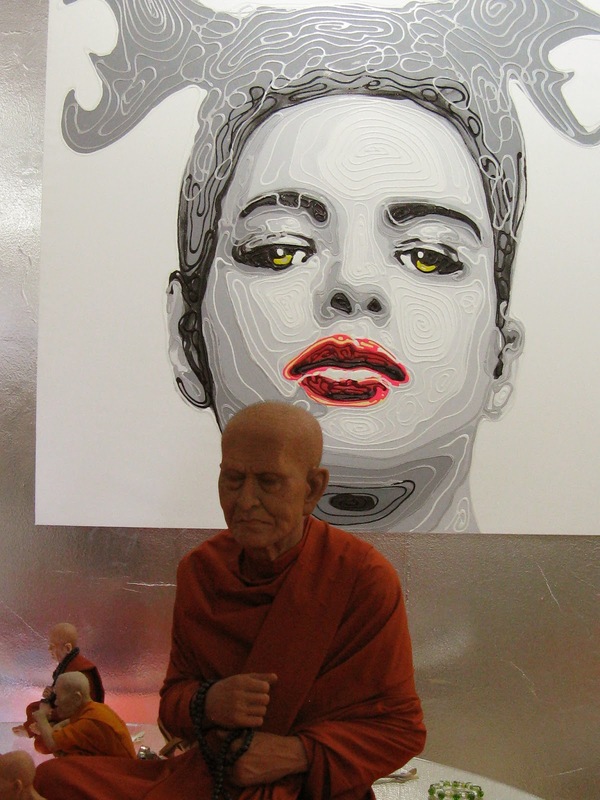 Though lauded for the ancient temple site of Angkor Wat, Siem Reap is also a center for contemporary art galleries, boutiques, restaurants and cafes. And, while troves of tourists descended on this magnificent complex, I wandered the streets of downtown Siem Reap, exploring what the town itself had to offer. I found out that down the street from my budget-minded and very socially responsible hotel, the Soria Moria, was an active Buddhist pagoda. It was within walking distance though I had the place to myself. There, one of the monks invited me into the principal, 100-year-old structure where they pray. I spent almost a week in Siem Reap and this is my YouTube video slideshow illustrating that it's a very creative mix of the old and the new. What an interesting excursion. Thanks for the lovely photos. I don't know how you do it --- being away so much and all that. I'd NEVER get any work done and just want to have fun all the time. Your powers of concentration must be strong! I know I will never get to Cambodia. Your blog always allows me to travel in my mind and I do thank you for that. Where will you go next? I'm wondering if there are any places you haven't been or are yearning to go. Your travels are amazing! How do you even pick a favorite destination?! You always go to the places I hope to someday get to! Great photos! Hi Brette, Glad you liked my photos. If you ever want advice on traveling there, let me know. Hi merr, Well, I specialize in Spain, Portugal, Israel and Iceland. After that, I'm always visiting places I haven't been before, focusing on hidden treasure travel. Hi Sheryl, there are so many places I haven't been, like Bhutan and Burma, to name just two. I'm heading to Greenland later in the year and much later this year, hopefully India. Hi Alexandra, thanks so much! Hi Roxanne, I'm a total workaholic, for sure.